Vowels are the sounds that are not pronounced by the touch of two organs of vocal tract, rather it is just an air-stream and the difference lies in the manner of its release. We cannot say which vowel is pronounced from where as we can say about consonants simply because of no touch characteristics. Still the linguists offered a diagram explaining that, and that will be discussed later. For present look at the following chart and try to understand the vowels and their sounds. Few things about the chart need to be explained. Diacritic and long vowels: diacritic is the colon like two dots symbol (:) as you see in /i:/, /a:/ etc. it prolongs the sound of the vowel, hence the vowel with diacritic is called long vowel. Short vowels: All those which are without diacritic and one-phoneme vowels are short vowels because their sound is not prolonged like long vowels. Diphthongs: Two consecutive vowels sounds, like; /ai/, /ei/ etc. these are two vowel sounds joined together and the voice glides from one to another. As it is said earlier that despite the difficulty the linguists have introduced a diagram that explains the origin of different vowel sounds. Just see the following diagram and read the details that follow it. Now see the above diagram and you will know about the origin of vowel sounds. 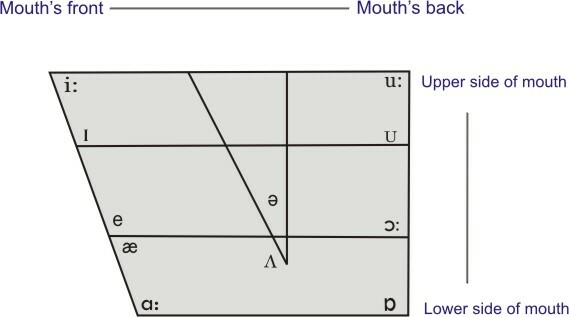 There are THREE types of vowels as explained in the above diagram. And they are upper and lower, front and back and rounded and unrounded. Only rounded and unrounded are not shown in the diagram but they are easy to understand as explained later on this page. They are called upper vowels because they are pronounced somewhere at upper side of oral cavity. Like; /i/, /u:/ etc. They are also called closed because when you pronounce them your mouth doesn’t open wide as compare to other vowels. They are called lower vowels because they are pronounced somewhere from the lower portion of the oral cavity. And when you pronounce them your mouth opens wider than other vowel sounds that’s why they are called open vowels too. Like; /a:/. The front vowels are those that are seemed to be pronounced from the front of mouth near front teeth, like; /i:/ and /a:/ etc. Note: Remember, where ever you find the gap in your oral cavity while pronouncing any vowel that gap indicates its origin once you practice you can easily feel the origin. They are such vowels by pronouncing them your lips become rounded, like /u:/ in the word boot. The vowels by pronouncing them your lips don’t get rounded, like; /a:/, /i:/ etc.